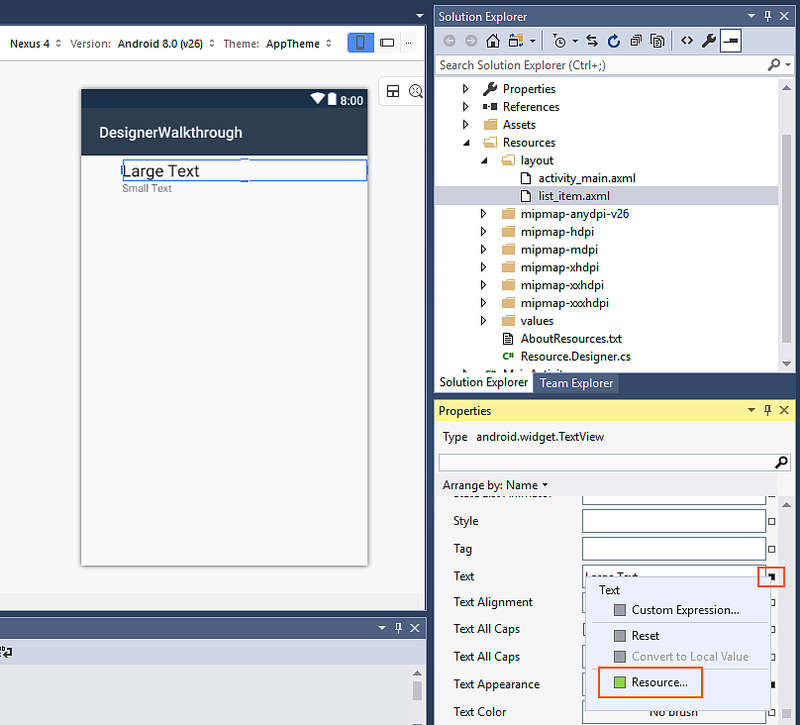 This topic introduces Xamarin.Android Designer features, explains how to launch the Designer, describes the Design Surface, and details how to use the Properties pane to edit widget properties. 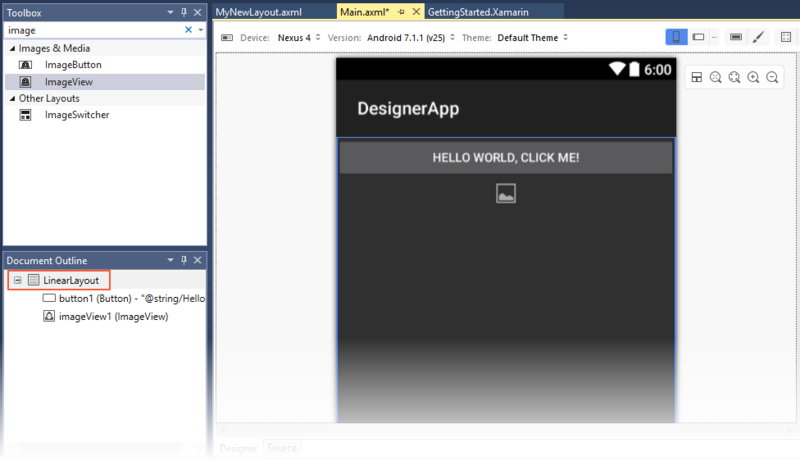 This creates a new .axml layout file and loads it into the Designer. Design Surface – Facilitates the visual construction of the user interface by giving you an editable representation of how the layout will appear on the device. 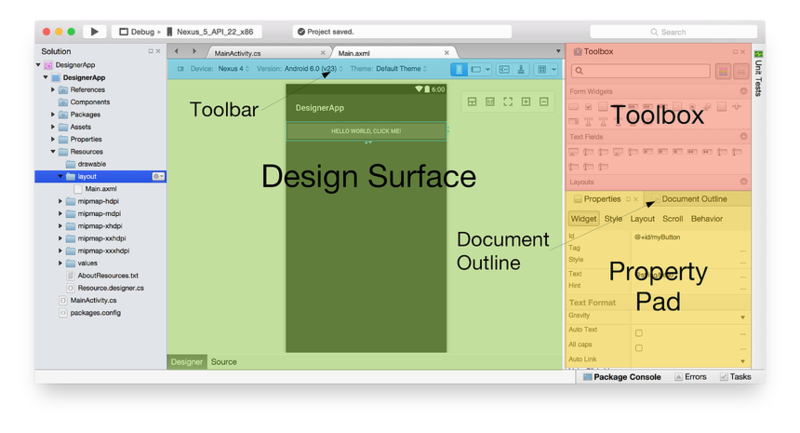 The Design Surface is displayed inside the Design Pane (with the Designer Toolbar positioned above it). 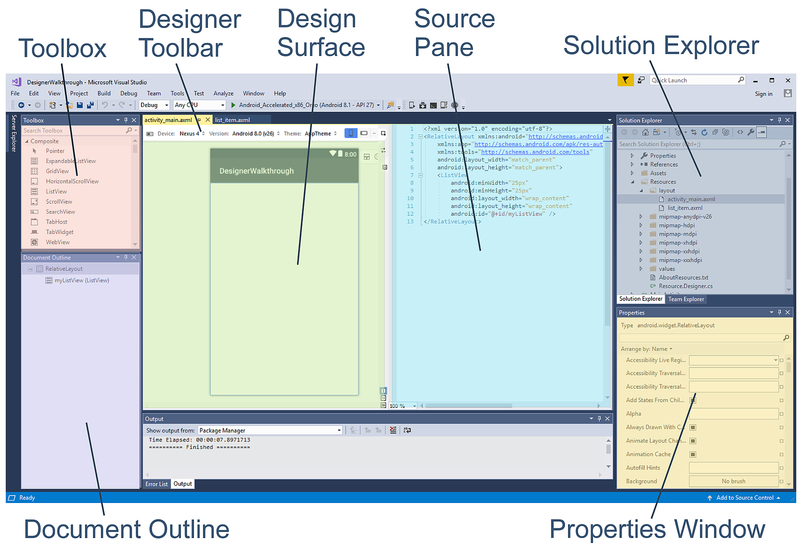 Source Pane – Provides a view of the underlying XML source that corresponds to the design presented on the Design Surface. Designer Toolbar – Displays a list of selectors: Device, Version, Theme, layout configuration, and Action Bar settings. 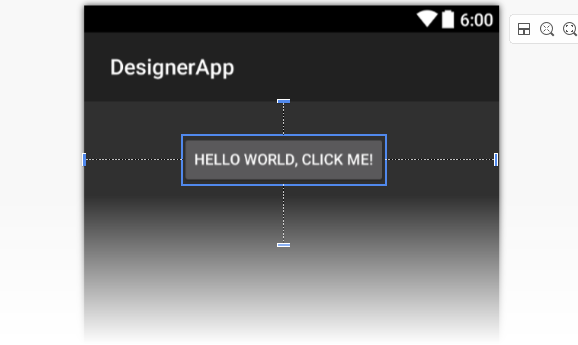 The Designer Toolbar also includes icons for launching the Theme Editor and for enabling the Material Design Grid. Toolbox – Provides a list of widgets and layouts that you can drag and drop onto the Design Surface. Properties Window – Lists the properties of the selected widget for viewing and editing. 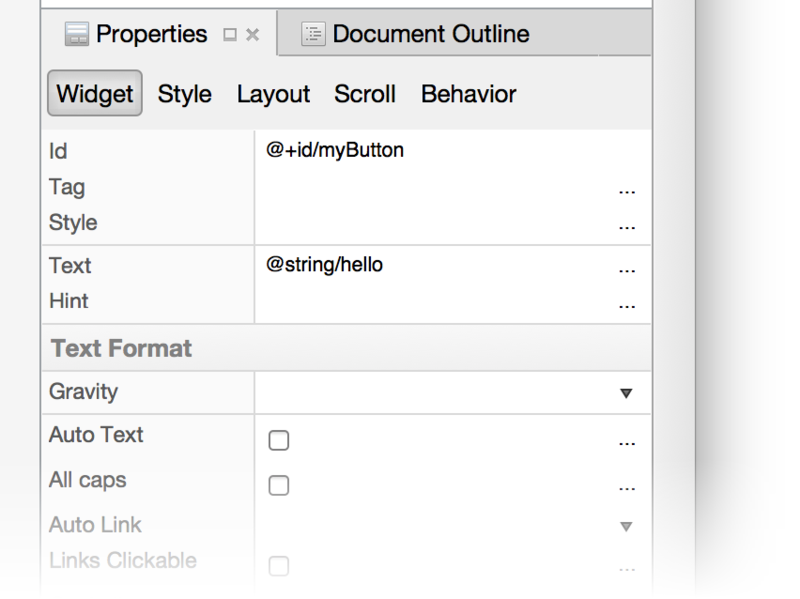 Document Outline – Displays the tree of widgets that compose the layout. You can click an item in the tree to cause it to be selected on the Design Surface. Also, clicking an item in the tree loads the item's properties into the Properties window. Additionally, widgets can be copied: you can use copy and paste to copy a widget, or you can drag and drop an existing widget while pressing the CTRL key. Alternative Layout Selector – Allows you to select from different layout versions. Device Selector – Defines a set of qualifiers (such as screen size, resolution, and keyboard availability) associated with a particular device. You can also add and delete new devices. Android Version Selector – The Android version that the layout is targeting. 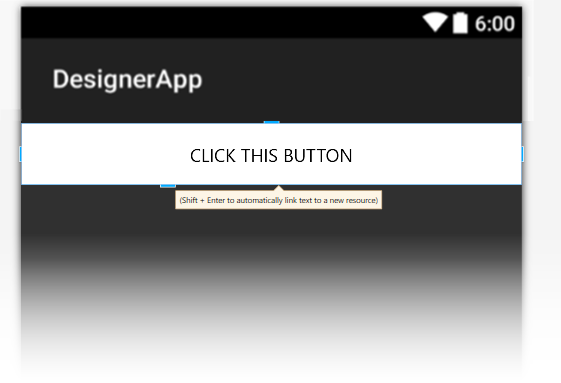 The Designer will render the layout according to the selected Android version. Theme Selector – Selects the UI theme for the layout. 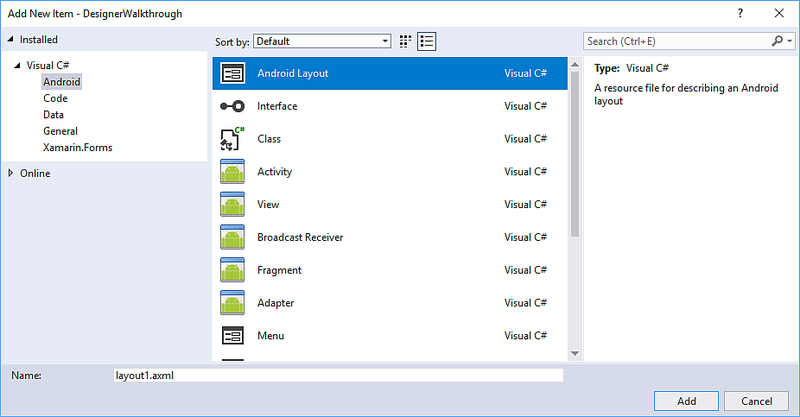 Configuration Selector – Selects the device configuration, such as portrait or landscape. Resource Qualifier Options – Opens a dialog that presents drop-down menus for selecting Language, UI Mode, Night Mode, and Round Screen options. Action Bar Settings – Configures the Action Bar settings for the layout. Theme Editor – Opens the Theme Editor, which makes it possible for you to customize elements of the selected theme. Material Design Grid – Enables or disables the Material Design Grid. The drop-down menu item adjacent to the Material Design Grid opens a dialog that enables you to customize the grid. Resource Qualifiers and Visualization Options provides detailed information about the Device Selector, Android Version Selector, Theme Selector, Configuration Selector, Resource Qualifications Options, and Action Bar Settings. Alternative Layout Views explains how to use the Alternative Layout Selector. 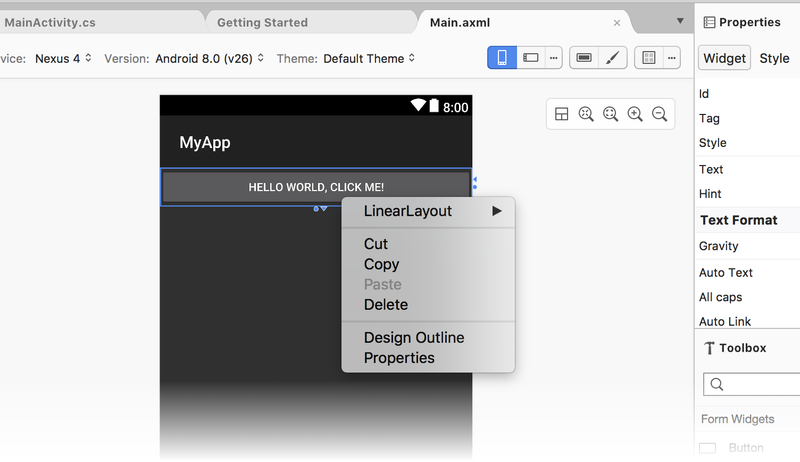 Xamarin.Android Designer Material Design Features provides a comprehensive overview of the Theme Editor and the Material Design Grid. 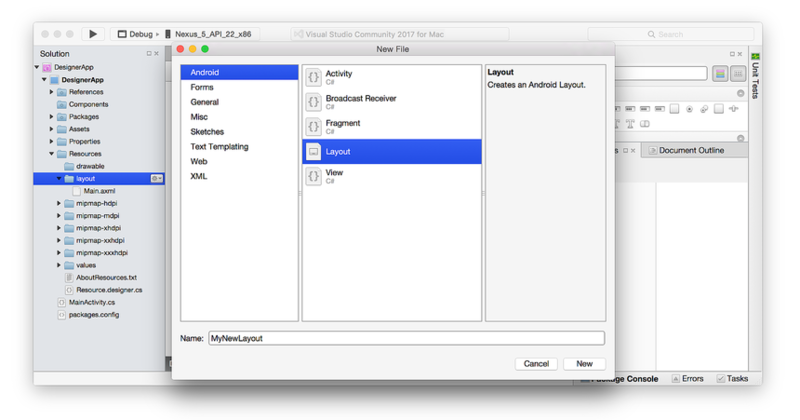 LinearLayout – opens a submenu for editing the LinearLayout parent of the TextView. Delete, Copy, and Cut – operations that apply to the right-clicked TextView. Highlight Containers – Highlights containers on the Design Surface so that they are easier to locate while zooming in and out. Normal Size – Renders the layout pixel-for-pixel so that you can see how the layout will look at the resolution of the selected device. Fit to Window – Sets the zoom level so that the entire layout is visible on the Design Surface. Zoom In – Zooms in incrementally with each click, magnifying the layout. 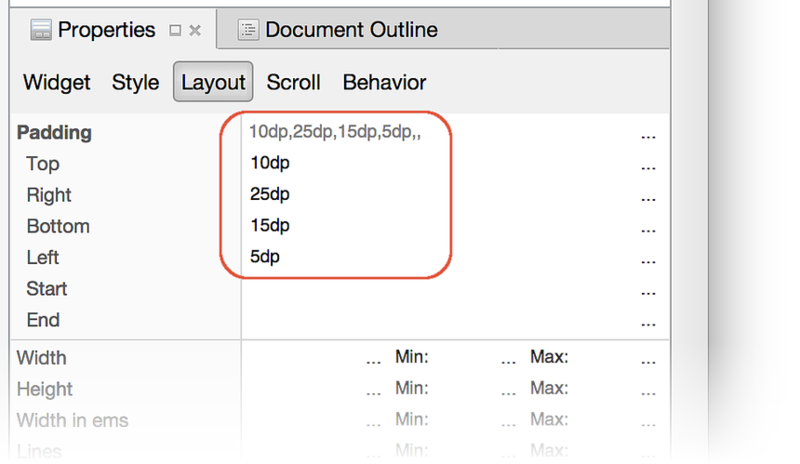 Zoom Out – Zooms out incrementally with each click, making the layout appear smaller on the Design Surface. Note that the chosen zoom setting does not affect the user interface of the application at runtime. Design – This topmost button, Design, selects the Design pane. 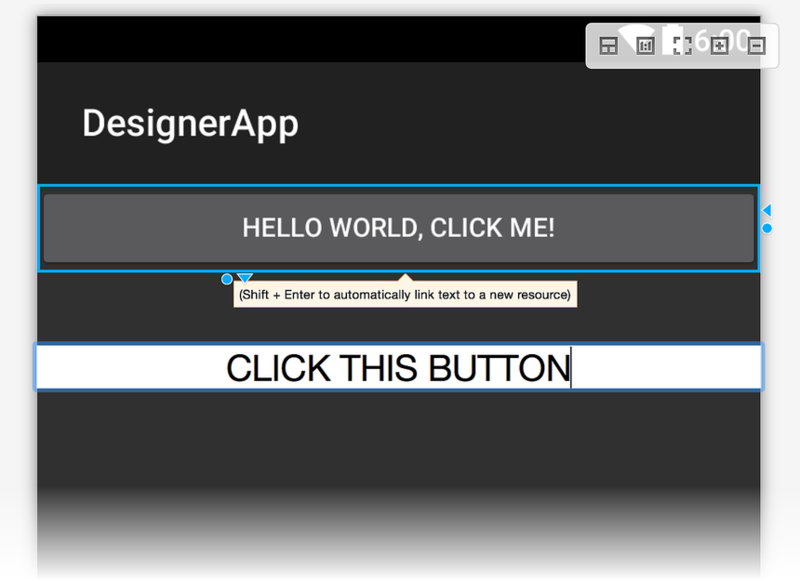 When this button is clicked, the Toolbox and Properties panes are enabled and the Text Editor Toolbar is not displayed. When the Collapse button is clicked (see below), the Design pane is presented alone without the Source pane. Swap Panes – This button (which resembles two opposing arrows) swaps the Design and Source panes so that the Source pane is on the left and the Design pane is on the right. Clicking it again swaps these panes back to their original locations. Source – This button (which resembles two opposing angle brackets) selects the Source pane. When this button is clicked, the Toolbox and Properties panes are disabled and the Text Editor Toolbar is made visible at the top of Visual Studio. When the Collapse button is clicked (see below), clicking the Source button displays the Source pane instead of the Design pane. Vertical Split – This button (which resembles a vertical bar), displays the Design and Source panes side-by-side. This is the default arrangement. Horizontal Split – This button (which resembles a horizontal bar), displays the Design pane above the Source pane. Swap Panes can be clicked to place the Source pane above the Design pane. Collapse Pane – This button (which resembles two right-pointing angle brackets) "collapses" the dual-pane display of Design and Source into a single view of one of these panes. This button becomes the Expand Pane button (resembling two left-pointing angle brackets), which can be clicked to return the view back to dual-pane (Design and Source) display mode. When Collapse Pane is clicked, only the Design pane is displayed. However, you can click the Source button to instead view only the Source pane. Click the Design button again to return to the Design pane. Changes made to the XML source are immediately rendered on the Design Surface; changes made on the Design Surface cause the XML source displayed in the Source pane to be updated accordingly. 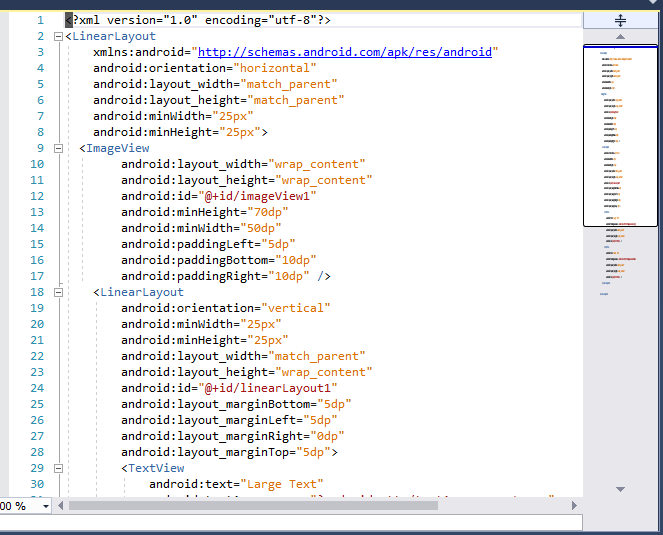 When you make changes to XML in the Source pane, autocompletion and IntelliSense features are available to speed XML-based UI development as explained next. 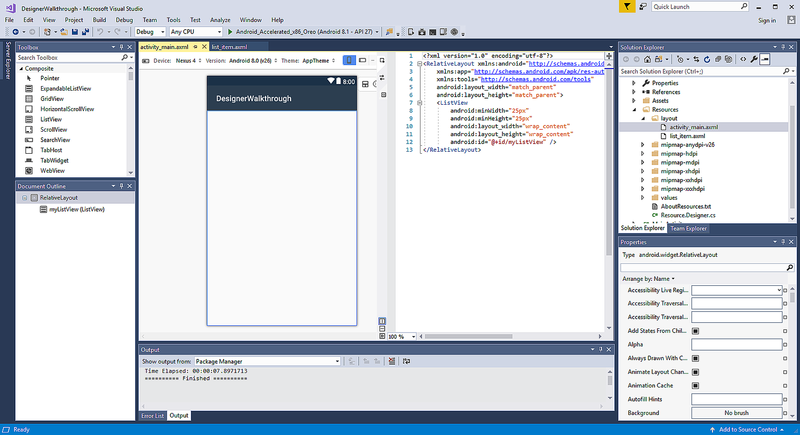 For greater navigational ease when working with long XML files, the Source pane supports the Visual Studio scrollbar (as seen on the right in the previous screenshot). For more information about the scrollbar, see How to Track Your Code by Customizing the Scrollbar. Press ENTER to accept the first listed completion, or use the arrow keys to scroll to the desired completion and press ENTER. Alternatively, you can use the mouse to scroll to and click the desired completion. At the bottom of this popup are two buttons (as outlined in red in the above screenshot). 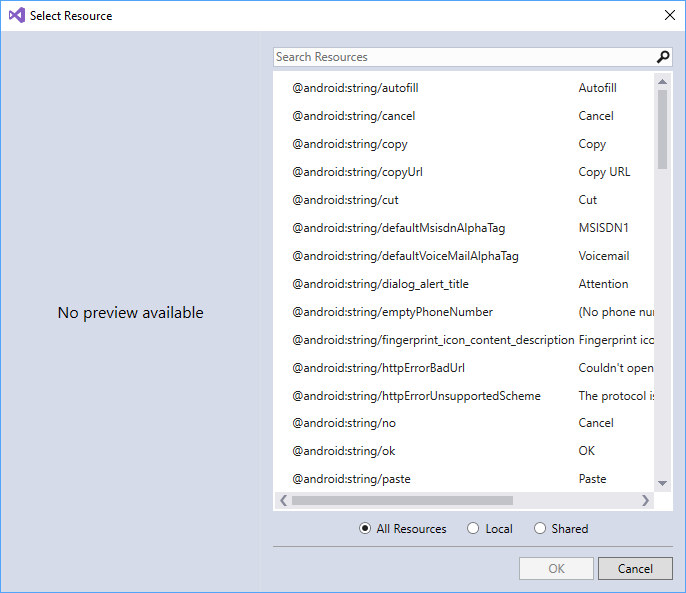 Clicking the Project Resources button on the left restricts the list to resources that are part of the app project, while clicking the Framework Resources button on the right restricts the list to display resources available from the framework. These buttons toggle on or off: you can click them again to disable the filtering action that each provides. The properties listed in the Properties pane change depending on which widget is selected on the Design Surface. 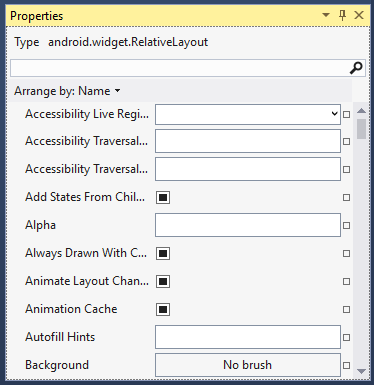 The properties of most widgets will be blank in the Properties window because their values inherit from the selected Android theme. The Properties window will only show values that are explicitly set for the selected widget; it will not show values that are inherited from the theme. Some properties can reference resources that are defined in files other than the layout .axml file. The most common cases of this type are string and drawable resources. However, references can also be used for other resources, such as Boolean values and dimensions. When a property supports resource references, a browse icon (a square) is shown next to the text entry for the property. This button opens a resource selector when clicked. 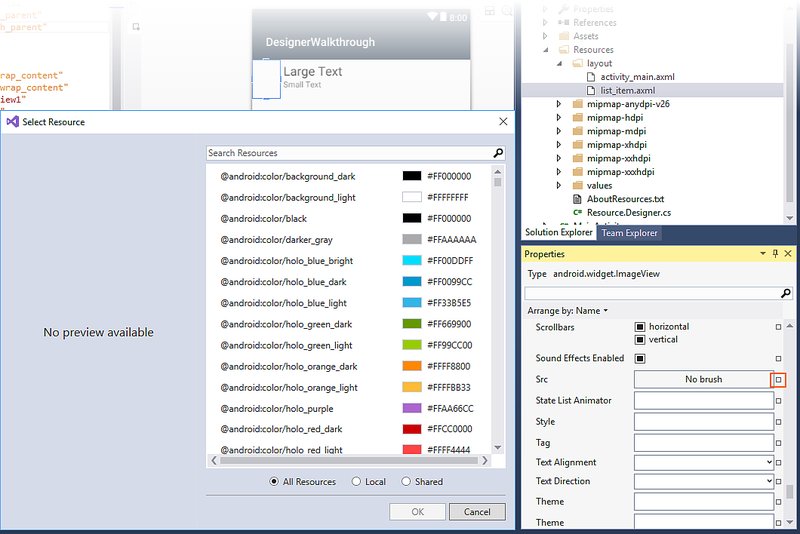 Clicking the blank square to the right of the Src property opens the Select Resource dialog with a list of resources ranging from colors (as shown above) to drawables. 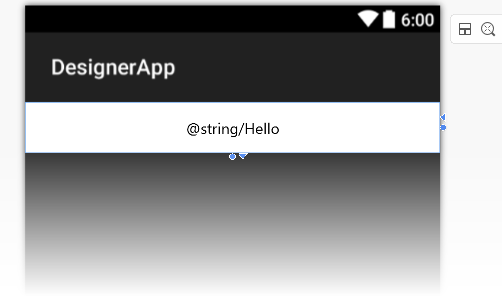 The Android Designer supports direct editing of certain properties on the Design Surface (so you don't have to search for these properties in the property list). Properties that can be directly edited include text, margin, and size. 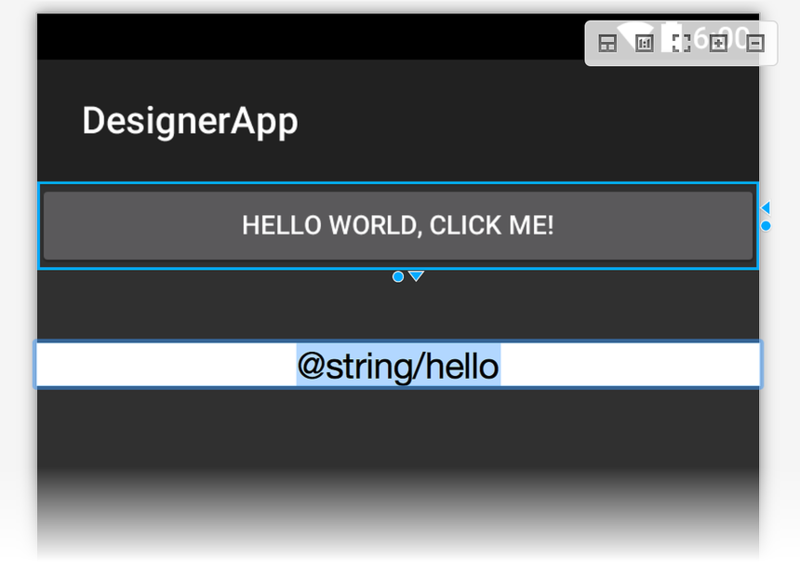 This change is stored in the widget's text property; it does not modify the value assigned to the @string/hello resource. When you key in a new text string, you can press Shift + Enter to automatically link the entered text to a new resource. 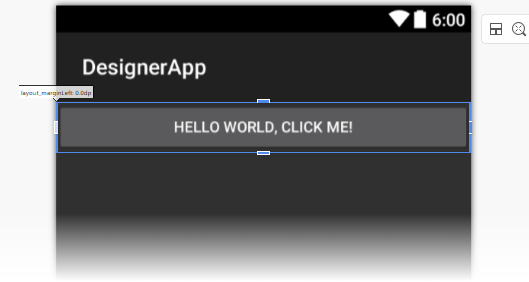 When you select a widget, the Designer displays handles that allow you to change the size or margin of the widget interactively. Clicking the widget while it is selected toggles between margin-editing mode and size-editing mode. Clicking the Wrap Content handle shrinks the widget in that dimension so that it is no larger than necessary to wrap the enclosed content. In this example, the button text shrinks horizontally as shown in the next screenshot. Clicking the Match Parent handle restores the size in that dimension so that it is the same as the parent widget. The outline of the selected widget (in this case, a LinearLayout) is also highlighted on the Design Surface. The selected widget in the Document Outline stays in sync with its counterpart on the Design Surface. This is useful for selecting view groups, which are not always easy to select on the Design Surface. The Document Outline supports copy and paste, or you can use drag and drop. Drag and drop is supported from the Document Outline to the Design Surface as well as from the Design Surface to the Document Outline. Also, right-clicking an item in the Document Outline displays the context menu for that item (the same context menu that appears when you right-click that same widget on the Design Surface). 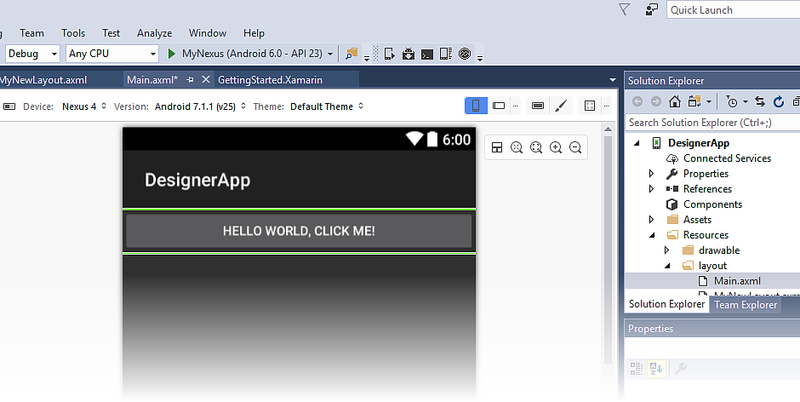 This creates a new .axml file and loads it onto the Design Surface. Design Surface – Facilitates the visual construction of the user interface by giving you an editable representation of how the layout will appear on the device. Toolbar – Displays a list of selectors: Device, Version, Theme, layout configuration, and Action Bar settings. 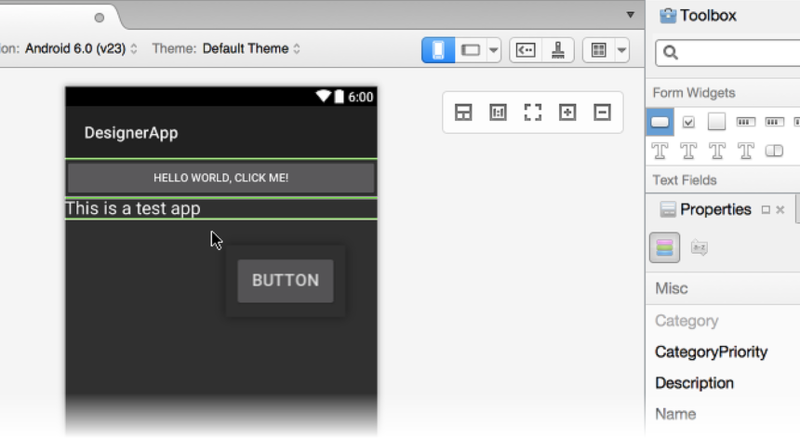 The Toolbar also includes icons for launching the Theme Editor and for enabling the Material Design Grid. Property Pad – Lists the properties of the selected widget for viewing and editing. Document Outline – Displays the tree of widgets that compose the layout. You can click an item in the tree to cause it to be selected in the Designer. Also, clicking an item in the tree loads the item's properties into the Property Pad. Device Selector – Defines a set of qualifiers associated with a particular device such as screen size, resolution, and keyboard availability. You can also add and delete new devices. Material Design Features provides a comprehensive overview of the Theme Editor and the Material Design Grid. 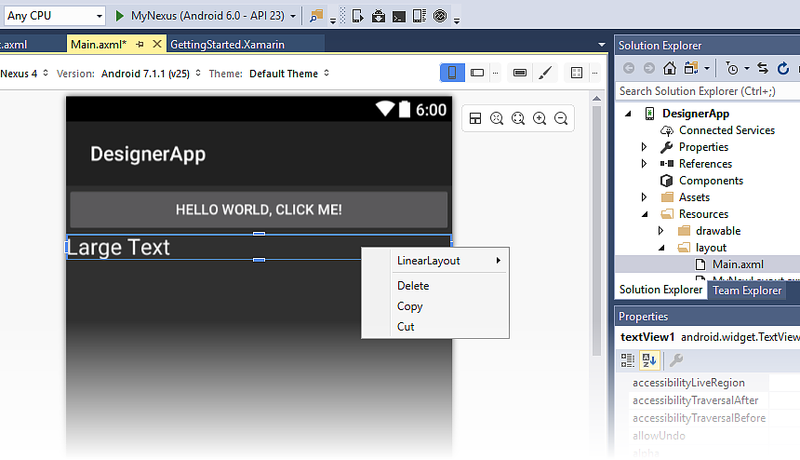 LinearLayout – opens a submenu for editing the LinearLayout parent of the Button. Cut, Copy, and Delete – operations that apply to the right-clicked Button. Widget – Main properties of the widget, such as id, visibility, text, etc. Properties for managing the widget's content are usually placed here. Style – Properties that change the visual appearance of the widget, such as font, text color, background, etc. Layout – Properties that set the location and size of the widget. Behavior – Flags that set how the widget behaves. 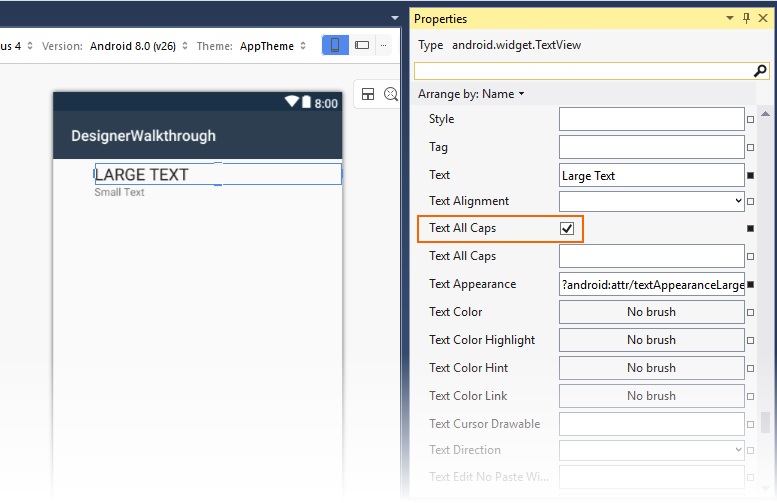 The properties of most widgets will be blank in the Property Pad because their values inherit from the selected Android theme. The Property Pad will only show values that are explicitly set for the selected widget; it will not show values that are inherited from the theme. Some properties can reference resources that are defined in files other than the layout .axml file. The most common cases of this type are string and drawable resources. However, references can also be used for other resources, such as Boolean values and dimensions. When a property supports resource references, a browse icon (an ellipsis, …) is shown next to the text entry for the property. When clicked, this button opens a resource selector. Boolean properties are normally shown as a check box in the Property Pad. When a Boolean property supports resource references, a small check box appears next to the property. A checked checkbox means true and an empty box means false. You can also directly enter a value such as true or false. Hovering your mouse over the input brings up a small text field icon. You can click on it if you wish to enter the value manually. Clicking the Wrap Content handle shrinks the widget in that dimension so that is no larger than necessary to wrap the enclosed content. In this example, the button text shrinks horizontally as shown in the next screenshot.